Perfect snowbird haven here! 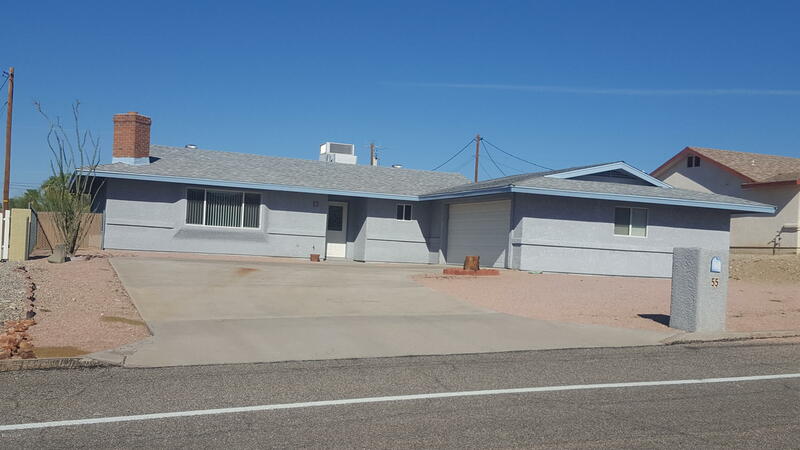 Must see this move in ready, fully remodeled adorable home, located in a very quiet neighborhood close to downtown area with a monster size backyard, fenced, large covered rear patio and big enough to add garages, pool, or casita, etc and backs to a wash! The following are all NEW: Totally remodeled LARGE KITCHEN w/ new cabinets with a few lazy susans, counters, sinks, smoke alarms, fans, Lo E windows and sliders, and blinds! Very spacious inside laundry, huge guest bath boasts dual sinks and lots of extra cabinets!! Roof and Air Conditioner have been replaced...this home doesn't look it's age once inside!!! Very level large lot with endless possibilities! Don't miss your chance on THIS one! Directions: Up McCulloch to El Dorado, go right. © 2019 Lake Havasu Board of REALTORS® All rights reserved. Information deemed to be reliable but not guaranteed. The data relating to real estate for sale on this website comes in part from the Broker Reciprocity Program. Real estate listings held by brokerage firms other than Brooks-Clark & Associates are marked with the BR logo and detailed information about them includes the name of the listing brokers. Listing broker has attempted to offer accurate data, but buyers are advised to confirm all items. Information last updated on 2019-04-23.